Slow down or speed up the play speed of any video of choice. 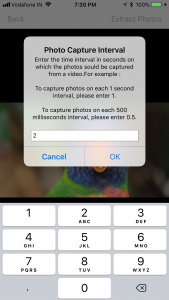 Using the application, the speed of video could be increased or decreased by specified number of times.The speed of the audio also increases or decreases along with the audio. 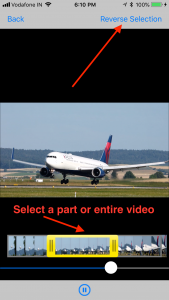 The resulting video is a saved as a separate video file where the speed up or down is applied to the selected duration in the entire video. The first requirement is to have a video that is stable. You will need a video that is recorded on a still surface. Such stable videos could be created on a Tripod. Panning movements or handheld shots will not work. When browsing through your existing video, always look for stable shots. Search for those moments in the video that could draw one’s attention; that you want to watch over and over again. These are the moments that make the best cinemagraphs. You can have a stable shot, with beautiful imagery, yet the movement you wish to highlight crashes with something in the foreground/background. To easily create a cinemagraph, pick scenes with no overlapping movement, where the movement is clear and precise. 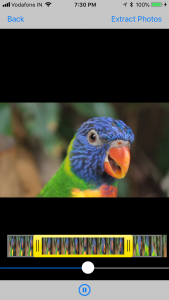 Be sure to have consistent light conditions inside the video that you select for the Cinemagraph.For example : If a video is bright at the beginning, it should have the same brightness throughout the interval that you select for the cinemagraph. You may come across a long scene that has all of the components listed above, but that you just can’t seem to shorten in length. Ideally, cinemagraphs are anywhere between 2-5 seconds in total. The shorter the better. You want to tell a story in the shortest amount of time, while holding the viewer’s gaze. The longer the loop, the more people stop watching, and the harder it is to tell your story. 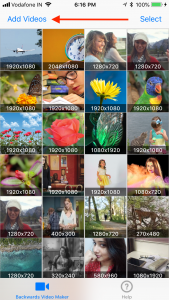 The first step is to select the duration of the video in which the Cinemagraph will be applied.For example, let us consider that there is a video of duration 1 minute. Now, we want to apply cinemagraph’s loop effect from 2nd second to 4th second only. In this case, we will have to be sure to select the desired time interval. This could be done by selecting the start and end points. In this example, the start point will be 2nd second and the end point will be 4th second. Before selecting the start and end points, please move your mouse cursor over the video that is playing. A slider will appear along with a play/pause button.Please press on the pause button to pause the video. Now, move the slider to a location that you want to set as a start time. After this, click on “Set Start Point” button. Similarly move the slider to a desired location and click on “Set end point“ button to set an end point till which the blurring will be applied to the video. Note : When the mouse pointer is over the video, you could also use the left arrow and the right arrow key to move “frame by frame” and select the exact start or end point. a) Move the mouse pointer to the video. b) A slider will appear.Pause the video. This will select the entire video. Once the selection is made, click on the button “Go to next step”. A new window will open. There, move the slider over the video to capture an appropriate frame that will be used as a still background for the cinemagraph. After this, press on “Select an area for Looped Motion”. A new window will open, please select an area to apply the looped Motion. 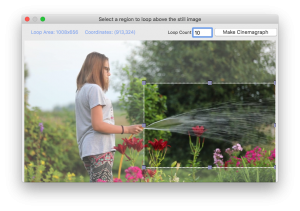 On the top right side, you will see an option to define the number of times to loop.This option specifies that how many times the Cinemagraph will play if you save it as a video. 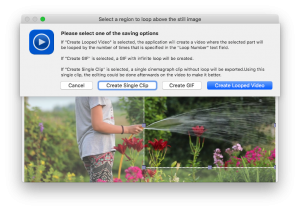 Please specify an appropriate value and click on “Make Cinemagraph” button.This will apply the loop effect to a selected area of the video for the time duration that we have selected. 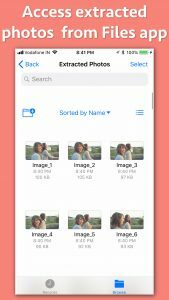 You could also create a GIF file to play the Cinemagraph endlessly. 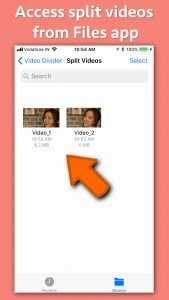 a) When the application opens for the first time, you will have to add the videos to it.In order to add the videos, please press on “Add Videos” button present at the top left corner. b) Once the videos are added, please tap on a video.This video will start playing. c) On this page, you could either select a part of the video to reverse or reverse the entire video itself. Now, please look at the top right corner. You will see a button called “Reverse Selection”. Please tap on this button. 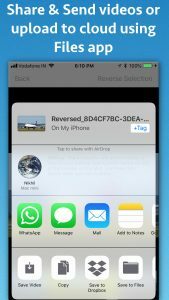 d) Once the Video has been reversed, a share dialog will be represented.Please use the share dialog to share the videos with other apps or save them to the Phone. Please open the “Files” application on the phone and go to On My iPhone/On My iPad. After this, tap on the folder “Reversed Videos”. 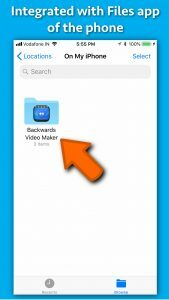 Please be aware that this folder only stores the latest reversed video.If you reverse a new video, the contents of this folder will be overwritten by the new reversed video. When the application opens for the first time, you will have to add the videos to it.In order to add the videos, please press on “Add Videos” button present at the top left corner. Now, please look at the top right corner. 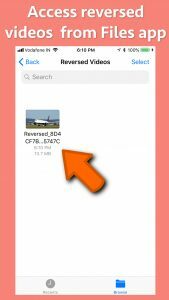 You will see a button called “Extract Photos”. Please tap on this button. 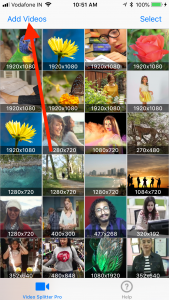 When you tap on this button, the application will ask the time interval at which the photos should be extracted from the video.You could specify the interval value of even 0.1 second. 0.1 second implies that the photo frame will be extracted from the video on time interval of 100 milliseconds. 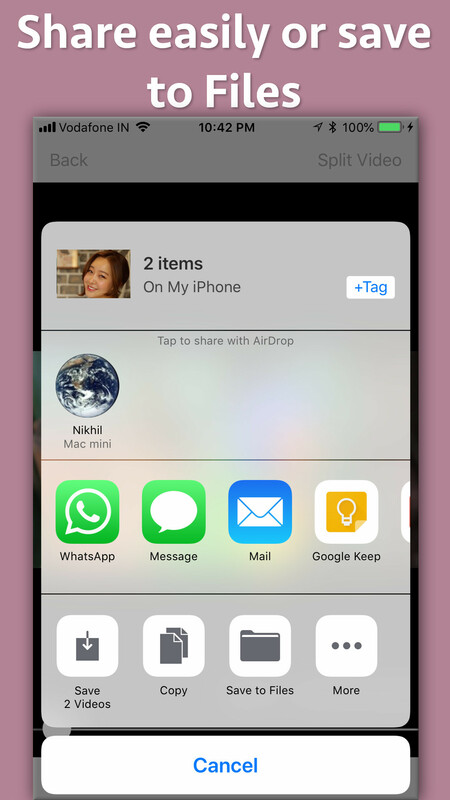 The application will extract all images from the selected part of the video and represent a share activity to share the extracted images. 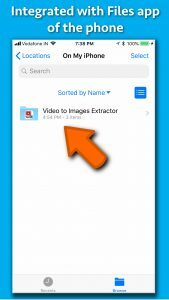 The extracted images could be accessed using the “Files” application as well. The below steps provide details on using the application. b) Once the videos are added, please tap on a video.This video will start playing. You will also see the duration of the video. c) Now, please look at the top right corner. You will see a button called “Split Video”. Please tap on this button. You will be asked the Time duration in which the video could be split. For example : If the time duration of a video is 50 seconds and you specify a split interval of 5, total 10 videos will be created. d) Please enter the time in seconds.If you want a split interval of 6 minutes, please multiply 6 by 60 to get the split time in seconds. (1 minute=60 seconds) .Hence for a split interval of 6 minutes, the entry will be of 360 seconds. 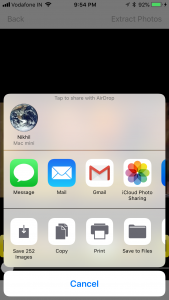 e) Once the Video has been divided, a share dialog will be represented.Please use the share dialog to share the videos with other apps or save them to the Phone. After this, tap on the folder “Split Videos”. 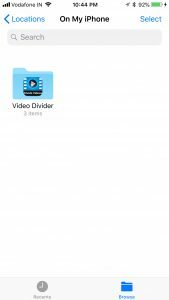 Please be aware that this folder only stores the latest divided videos.If you divide/split a new video, the contents of this folder will be overwritten by the new split videos.